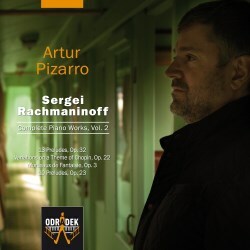 Artur Pizarro continues his complete Rachmaninov solo piano works (see review of Volume 1) with this second volume. This pair of CDs includes both sets of Preludes, the Variations on a Theme of Chopin and the six Morceaux de Fantaisie – which contains his only other Prelude, the C sharp minor Op.3 No.2 which he came to detest given the invariable audience clamour for him to play it as an encore in his recitals. Those early pieces gives a good indication of Pizarro’s qualities — serious, dedicated, and introspective. The emotional temperature is a little lower, and the contrapuntal insight a little higher, than many artists seek in this composer. Morceaux these six pieces may be, but they are more than morsels in Pizarro’s hands for he finds many a nuance in them that others miss. The Chopin Variations is the Cinderella work among Rachmaninov’s solo piano music it seems, less often programmed and recorded than most of the others. The invention is perhaps not consistently of the composer’s best, and he later performed a shorter version which he intended to publish but never did. So it is the full text that Pizarro plays here and he sounds as devoted to this score as he does to all the other pieces. The final variations are spoken of by some as superfluous but in this recording they seem to belong to the work just as much as their predecessors. Rachmaninov is never well served by cuts, even his own, and such works as the Sonata No.2 and Second Symphony are best done with the full original text. The Chopin Variations is a work which still needs champions, and anyone wanting to get to know it would do well to start with Pizarro’s account, for he makes it sound an engaging and well-integrated composition, if not quite of the calibre of his late sets of variations on Corelli and Paganini. With the two sets of Preludes, Opp. 23 and 32, we enter highly contested territory, and Pizarro is clearly aiming at a different view of them than most of the many available recordings. While fully able to encompass their technical demands, and with a disarming lightness of touch, he is not that interested in the virtuoso display aspect, maintaining his sobriety of expression even in the normally fiery and exciting pages of numbers 2 and 5 of Op. 23. In the latter the Alla Marcia marking is taken steadily, and the lyrical meno mosso central section is more reflective than enraptured. The E flat major No.9 feels a little sedate for a Presto, though the closing Largo of No.10 suits this withdrawn approach perfectly. It sounds as if it was recorded at one in the morning and with a glass of vodka handily placed on the piano. This pattern is repeated in the Op.32 set; the vivace and con brio markings of numbers 3 and 4 respectively are underplayed, but there is much compensation in the space this creates for bringing out exquisite detail in Rachmaninov’s rich inner parts. Pizarro’s contemplative manner brings rich rewards in the great and glorious No.10 in B minor, which has a wonderfully sonorous and imposing climax. The piano recording matches the approach, warm, bass-rich and consoling, with not much glitter in the treble. It is a sound which embraces rather than dazzles the listener. There is no booklet at all, for that which came with Volume One of the series covers all the music in subsequent volumes. The discs in the series are even through-numbered, such that the two discs in Vol.2 are labelled ‘III’ and ‘IV’. There are track listings and timings with these discs at least, but there is a clear assumption that you will want all seven CDs. That perhaps is the best way to think of this issue in terms of its place in the catalogue, as part of a complete set which will become a viable alternative to, because significantly different from, those of Ashkenazy and Shelley. Pizarro’s reflective quality has plenty to commend it, not least that there is beauty and meaning to be found in this music that the brilliant extroversion of some players will miss. It is unlikely to be a top recommendation for the two sets of Preludes, when you can get those on several fine one-disc surveys such as those of Boris Berezovsky (Mirare 2005) and Steven Osborne (Hyperion 2009), or my own abiding favourite, Rustem Hayroudinoff (Chandos 2003). He provides the Russian virtuoso glamour that Pizarro actively eschews, and which for most collectors will be an essential ingredient. But I will certainly return to Pizarro for his many contemplative insights, and remain eager to hear the next installment of this series.